The Portal at Voi, known to the scientific community as the Excession at Voi or simply the Excession and sometimes referred to as the Artifact, is a massive Forerunner construction in Kenya, Africa on Earth. Designed to generate a slipspace portal to Installation 00, it was built across and eventually buried beneath an area that would come to encompass the town of Voi and the city of Mombasa, and it was uncovered by the Covenant during the Battle of Earth in late 2552. It can be activated by a specific keyship, that being the Covenant's "Forerunner Dreadnought", and was so activated upon its unearthing. It was reactivated once more in March of 2555 with the help of Drifts Randomly, a Huragok that had worked on the Dreadnought. "Who will use this portal? Who will live to return here? And what will they think of this machine that I’ve buried? Those I have fought for, for so long. Those who, it is clear to me now, ultimately will and must inherit the Mantle. I can only hope that they will survive and upon returning, that they will find this portal and use it to travel to the Ark—in order that they might discover their rightful place in this galaxy, and the great responsibility they have finally inherited. They are the last of my children. They must reclaim their birthright." — The Librarian thinks on the future of the portal and its use by humanity. Ancient humans observe the portal at some point following their species' reintroduction to Earth. Shortly before the firing of the Halo Array, the Forerunner known as the Librarian ordered the construction of the portal beneath a savannah in what would later become Kenya. The Librarian knew that the portal would not be completed before the Halos were fired, and thus construction would continue for at least a century after Earth was reseeded. She had it built with the hope that humanity would one day use it to reap the benefits of the legacy the Forerunners left on the lesser Ark. A Gargantua-class transport sent by 343 Guilty Spark at her request, along with the necessary components mined from the Earth, was used to build the portal. At least two varieties of sentinels, Retrievers and Assemblers, were deployed from the transport and were also important to its construction. When humans and other lifeforms were reintroduced to Earth, they emerged at the planet above the portal in Africa. However, work on it would continue for multiple generations. Its continual construction was witnessed by humans, including an African elder named N'chala, who was oblivious to its purpose and considered the sentinels to either be gods or to be under their direction. The artifact eventually came to be entirely buried in the earth. "Truth could've landed anywhere, but he committed all his forces here. East Africa. The ruins of New Mombasa. Then, they started digging." — Miranda Keyes informs John-117 of the Covenant's excavation. The Portal, viewed during the day, prior to its activation. By at least the nineteenth century, the portal was entirely submerged beneath the land occupied by the city of Mombasa and the town of Voi. Additionally, at least a portion of the portal was covered by a man-made lake at some point between the early 21st and mid-26th centuries. At some point after the dawn of the 24th century, the UNSC's Office of Naval Intelligence discovered a small section of the portal structure located below the metropolis of New Mombasa, and constructed a major facility known as the ONI Alpha Site in the city in order to conduct covert research on the artifact. In 2551, toward the end of the Battle of Meridian, a luminary was discovered by the Covenant on the colony. This luminary would later be presented to the Prophet of Regret and reveal to him the location of the portal. 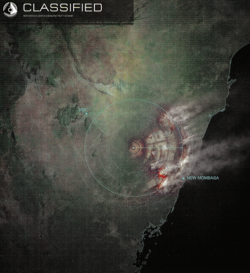 In October of 2552, a seismic anomaly originating with the portal was discovered in a survey conducted by New Mombasa's urban infrastructure AI, the Superintendent, for Dr. Endesha, revealing the location and full extent of the structure to him. Following the Prophet of Regret's flight from the Sol system during the Battle of Earth, a massive Covenant fleet led by Jiralhanae arrived to swiftly take control of the battle from the Sangheili. These forces attempted to use the data gathered by the Superintendent to pinpoint the location of the artifact, but were eventually forced to discover its location on their own. On the same day, they started the uncovering of the artifact by glassing. 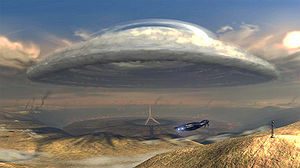 By November 17, 2552, the entire lake that lay over where the structure was buried had been vaporized by Covenant ships and the earth overtop of the artifact had been burned away by focused glassing to unveil it. The Prophet of Truth landed the Forerunner Dreadnought on the structure, and an unusual electric storm formed above it. Before its activation, the prophet personally traveled to the Superintendent's data center deep underneath where New Mombasa used to be, now occupied by a number of Covenant Huragok, and observed a section of the artifact visible from the facility. The UNSC attempted to attack the keyship, falsely presuming the portal to be the Ark itself, but was stopped by Covenant Type-27 Anti-Aircraft Cannons. A small force in the city of Voi, consisting of John-117, Thel 'Vadam, Marines, and factory workers from a Traxus Industries facility, neutralized an anti-aircraft battery to clear a path for three frigates and numerous Longswords. These then made several attacks on the Dreadnought with MAC cannons and ASGM-10 missiles, but to no effect. At that moment, the gateway finally activated, opening a large slipspace rift above the Portal which led to the real Ark. Truth and his fleet advanced through the rift and were pursued by the Fleet of Retribution and the UNSC Forward Unto Dawn. "There are more secrets locked under our feet than we dare speculate on." — Doctor William Iqbal in a letter from the Department of Xenoarchaeological Studies at Edinburgh University to security-cleared faculty and onsite graduate students. The portal as seen from orbit immediately after it collapsed following damage done to the Ark. When Installation 08 was prematurely fired on December 11, 2552, it tore itself to pieces, doing an enormous amount of damage to the Ark. This sudden destruction caused the portal to collapse while the Forward Unto Dawn was still traveling through it back to Earth. The ship was torn in to two large pieces at this time and only the fore half made it back to Earth, crashing into the Indian Ocean. The Dawn did not exit at the point in Earth's atmosphere where it would have had the portal remained wholly intact, but instead emerged from slipspace in Earth's orbit, just narrowly allowing Thel 'Vadam a destination to land. From that point onward, the portal remained inert and inaccessible. In March of 2553, following a ceremony honoring the fallen of the Covenant War held near the site, the Excession was isolated from the rest of the East African Protectorate and heavily guarded. Civilian xenoarchaeologists were hired by the Office of Naval Intelligence to study the artifact. While closed, it was still drawing power from an unknown source and the majority of the passageways below it were still unexplored. It was suspected that the portal had additional as-of-yet undiscovered functions besides simply creating a gateway between Earth and the Ark. In 2555, scientists exploring Installation 07 discovered a countdown sequence and it was determined that it was originating from the Ark. It suddenly became of paramount importance that the portal be reactivated. The UNSC reached out to the Swords of Sanghelios and a Huragok named Drifts Randomly that had worked onboard the Forerunner Dreadnought was brought to Earth. After a few days, it was able to open the portal using data from the keyship it had internalized. A joint UNSC and Swords of Sanghelios team was sent through the portal to prevent the activation of the Halo Array. The countdown was part of a ploy by the Ark's monitor, 000 Tragic Solitude, to make the humans on Earth reactivate the portal so that he could send Retriever Sentinels to mine the Sol system for materials to repair damage done to his installation. Many Retrievers poured through the portal and the UNSC Home Fleet engaged them in battle. Operation: FAR STORM successfully prevented Solitude's plan from coming to fruition, however, and the sentinels were recalled. Afterwards, the UNSC used the now-active portal to send researchers to the Ark. Following the Created takeover of Earth, Installation 00's failsafe measures seemingly closed the portal once again, keeping the Ark safe from Cortana's iron fist. Since the portal closed without warning, the UNSC science personnel on the Ark were stranded there, with no way to contact the rest of the UNSC. A month later, the Ark was invaded by the mercenary group known as the Banished, who massacred the UNSC personnel there. Months later, the long-lost UNSC Spirit of Fire was pulled to the Ark through unknown means. Satellite imagery of the portal being uncovered. The massive structure that opens the portal--at least the portion that has been uncovered--is 117 kilometers in diameter. When the portal is inactive, it appears as nothing more than a slightly convex metal disc of a Forerunner alloy. Glyphs can be seen from high above in the metal framework of the construction. At the very center, there is one shaped like a circle pierced by four spokes, which subdivide it into eight sections. The portal is powered by its own internal source, which lies far below what can be seen of it on the surface. There are extensive passageways that stretch down into the earth all throughout it. These passageways link information systems, engines, and control stations. Immediately beneath the domed shape of the structure's exterior, one can view it from a perspective where it appears concave from a sort of observation deck paneled with glass. At the base beneath the hinge of each pylon there are numerous consoles and instrument panels covered with Forerunner runes. The portal can only be opened in response to a specific set of data. This data was carried by the specific keyship, which the Covenant called the Forerunner Dreadnought, that was designed to interface with the portal structure. Even without the actual keyship itself, however, the portal can be activated by a Huragok named Drifts Randomly, because it has internalized the necessary information from the keyship. Before the portal fully opens, there is a not-yet-understood process which builds up to the final opening. During this process, a great electrical storm is generated above it due to the creation of such a vast, stable slipspace rupture in atmospheric conditions. Gusts of wind inside such a storm can exceed two-hundred miles per hour. When the time finally comes for the portal to open, the fourteen pylons will rise and the center of the disc will sink further into the ground. A giant beam of energy will shoot up from the center of this disc. The portal itself, taking the shape of a sphere, will be supported by beams emitted from each of the raised pylons. It takes approximately 24 days for any ship entering the portal to arrive at the Ark. Usze 'Taham: "Where exactly are we going?" Spartan Frank Kodiak: "The center of the operation." — 'Taham and Kodiak before descending underground. Since the portal was first uncovered and the war with the Covenant ended, the United Nations Space Command, and specifically the Office of Naval Intelligence, has sought to further understand the structure that had been buried under their feet. Having found a way to access the artifact's many information systems, engines, and control stations, ONI constructed numerous facilities around and within the artifact in order to research it, staffed by roughly two hundred and twenty-seven engineers, technicians, and security personnel. One notable facility is termed Research Center Alpha, which lies at the base of one of the portal's pylons and can only be traveled to via an elevator from the surface. Science personnel were stationed at other pylons as well, such as Pylon Five. Branching out across the undercarriage of the machine was an ONI-fabricated network of scaffolding and gantries, allowing access to deeper and higher sections of the underground. Before the portal was reactivated, the UNSC had to illuminate any portion of the structure explored with floodlights, but once it came to life again, this was no longer necessary. Before Halo: The Essential Visual Guide established a definitive diameter for the portal, there was some confusion regarding its size. This was due to a conflict between the in-game sizes of the Forerunner Dreadnought in Halo 2 and Halo 3, with the latter depicting the ship as being far smaller than its former incarnation. Based on the map geometry in Halo 3, the Portal could be estimated to be approximately 25 kilometers in diameter. However, this figure is contradicted by the geography of the Portal's surroundings; since the structure stretches from the edge of where the metropolis of New Mombasa used to be all the way to the edge of what was formerly Voi, a distance of well over 100 kilometers. The canonical size of the portal can be derived by referencing the in-game measurements of the Forerunner Dreadnought as it appears in Halo 2. The sizes of the portal and the Dreadnought in Halo 3 were taken as a liberties resulting from to engine limitations; generating map geometry for over a 117 km2 area would have been extremely taxing, if not impossible, for the game engine. In the "Behind the Scenes" section of the Halo 2 Collectors Edition, there is a sketch of the portal. The fourteen pylons of the portal structure may be a reference to the number 7, as 7+7=14. The entire structure also appears to be constructed of seven identical parts, those being seven pairs of pylons. The Portal is also 117 kilometers in diameter, which is a direct reference to John-117. Originally, the structure that ended up being the portal had been intended to be the Ark itself. Interestingly, the UNSC assumed the portal was the Ark as it neared activation in Halo 3. The pylons bear a striking resemblance to the monoliths around the Atmosphere Processor in the film Aliens. The portal encountered in the first chapter of Spartan Ops Episode 7 is nearly identical in design to that of the portal at Voi; with pylons that withdraw downward when the portal is deactivated. An overhead view of the Portal. Ancient humans viewing the portal in the years after the fulfillment of the Conservation Measure. Truth's fleet uncovering the Portal. The Portal is activated in the Halo 3 Announcement Trailer. A portion of the portal structure that was visible underneath the ONI Alpha Site. The portal as it appeared when activated. The keyship is piloted through the portal after having activated it. 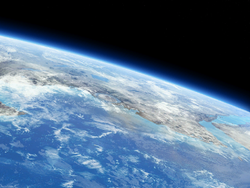 The portal, as seen from Earth's orbit. Halo: Combat Evolved-era concept art for the structure that would eventually become the Ark portal. Concept art for "the Ark", as it was once conceived as, seen in the Halo 2 Collector's Edition DVD. A seismic survey of the Great Rift Valley, with the yellow dot marking the location of the portal. ↑ Halo: Hunters in the Dark, page ?? ↑ Marcus Lehto on Twitter.